John FitzGilbert is best known as the father of William Marshall. The fitz at this stage in proceedings simply means that John was the son of Gilbert Gifford. Gifford can be translated as “chubby cheeks” – though I’m not terribly sure how terrifying the name Gilbert Chubby-cheeks actually might be. The marshal element of the equation is the family job. Both John and Gilbert before him held the office of marshal in the royal household. This meant that they were responsible for horses, hawks, whores and anything else that the royal household might need – think of the role of marshal as being similar to that of quartermaster. It also entailed keeping order and making sure that all the members of the household (the important ones anyway) had somewhere to sleep as well as transport as the court journeyed on its many progresses. Gilbert and John had duelled with William de Hastings and Robert de Voiz in a trial by combat for the right to hold the post of marshal in the household of King Henry I . In 1130, when his father died, John paid 40 marks for his job as marshal – indicating that the perks were worth considerably more than the fee. He was about twenty-five years old. He married the daughter of Walter Pipard at about the same time. Pipard was a minor Wiltshire landowner. John was taking the first steps towards extending his landholding and extending his sphere of influence. King Henry I died on 1st December 1135 from a surfeit of lamphreys – although of course this was accompanied at the time by the rumour of poisoning. John FitzGilbert continued in his role as marshal for Henry I’s successor King Stephen for the next seven years. This might have caused John some disquiet because, of course, Henry had forced his barons to swear an oath to put his only remaining legitimate child – the Empress Matilda- on the throne. We don’t know how John felt about that and initially his own oath of loyalty was given to Stephen (pictured at the start of the post) who arrived in England ahead of Matilda and took control of the treasury as well as the crown. We know that John went with Stephen to Normandy in 1137 and that John was sufficiently trusted by Stephen to be rewarded with custodianship of Marlbourgh Castle and Ludgershall. John held lands in the Kennet Valley in Wiltshire given to the family after the Conquest including Hamstead Marshal and Tidworth. For John it meant more power within Wiltshire but it also led to increasing hostility with the earls of Salisbury who felt that Ludgershall belonged to them. As the civil war between Stephen and Matilda gained momentum John fortified his castles and began to attack those men in his locale who supported Matilda. The chronicle of the Gestia Stephanie describes him as “the root of all evil.” It certainly appears that John was rather good at skirmishing, raiding and generally making a nuisance of himself. As with other warlords he doesn’t always appear to have been too bothered by which side he was attacking. The chronicle notes that he “had no time for the idea of peace.” He was also known as a cunning opponent as can be demonstrated in the tale of Robert fitz Hulbert. Robert fitz Hulbert was a mercenary in the pay of Robert of Gloucester on behalf of the Empress Matilda. In 1140 fitz Hulbert seems to have decided that the route to fortune lay in supporting neither Stephen nor Matilda. He approached John who had a bit of a reputation for doing his own fair share of looting and suggested that between them they could control John’s area of Wiltshire. John appears to have invited Robert around to one of his fortified gaffs for a goblet of wine and to discuss the venture. Robert somehow ended up in one of John’s less comfy dungeons prior to being sold to the earl of Gloucester for five hundred marks…definately cunning. By 1141 John seems to have felt that the tide had turned away from Stephen. This was probably to do with Stephen’s capture at Lincoln and imprisonment in Bristol but it may also have had to do with the fact that Robert, earl of Gloucester (illegitimate half brother of Matilda) held extensive lands that marched with John’s. John switched sides. It should be pointed out that some barons and knights changed sides more times than they changed their socks – at least John only did it the once! When King Stephen came to England he held his council at Oxford, and there he took Roger, bishop of Salisbury, and Alexander, bishop of Lincoln, and the chancellor Roger, his nephews, and put them all in prison till they surrendered their castles. When the traitors understood that he was a mild man, and gentle and good, and did not exact the full penalties of the law, they perpetrated every enormity. They had done him homage, and sworn oaths, but they kept no pledge; all of them were perjured and their pledges nullified, for every powerful man built his castles and held them against him and they filled the country full of castles. No wonder the nineteen years of civil war came to be known as The Anarchy when Christ and all his apostles slept. By May 1141 John can be found with Matilda and according to William Marshall’s biography saved the empress from capture that August during the rout of Winchester when Matilda’s siege was lifted by men loyal to Stephen. In truth it was Robert of Gloucester who fought a rear guard action at Winchester but it is undoubtedly true that John was fighting on the empress’s behalf at Wherwell Abbey with William D’Ypres when it was fired and John left for dead in the smouldering rubble. John survived the blaze but lost an eye when melted lead fell from the roof into his face. As the year drew on, and John survived his injuries, it became clear that the feud with the earl of Salisbury had to be ended. John’s marriage to his first wife, Aline Pipard, was annulled. It was done in such a way that the two sons of this first marriage remained legitimate and there was no stain on Aline’s honour. She went on to marry Stephen de Gai who was the earl of Salisbury’s uncle. 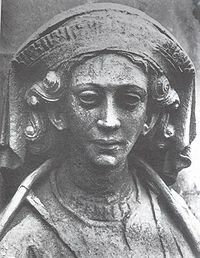 John then married the earl of Salisbury’s sister Sibylla in 1144. Not only did this bring peace between the two families (if for no one else in the area) but it meant that John elevated his social status once more and as the Empress Matilda’s position strengthened John’s name can be found on assorted charters of the period. John and Patrick of Salisbury seemed to have buried their differences given that the chroniclers of the period paint a picture of Wiltshire under the brother-in-laws’ heels. John took land that didn’t belong to him, not only from the laity but also the clergy (which probably accounts for the tone of the chronicles which were written by ecclesiastical types.) When King Stephen died on October 25 1154 Matilda’s eldest son Henry Fitzempress became king. John was rewarded well for his loyalty. John is probably most famous, or possibly infamous, for the way in which during the siege of Newbury, another of John’s castles, (Historians and archeologists argue that the besieged castle was more likely to be at Hamstead Marshal rather than Newbury) that he handed over hostages including his five year old son William in order to buy time. King Stephen thought it was so that the garrison could prepare to exit stage left. However, as soon as the Reading road was cleared of besieging forces John took the opportunity to resupply the castle. When Stephen’s men threatened young William Marshall with hanging in response to John’s perfidy he retorted that he had the hammers and anvils to make more sons. Young William was the fourth of his sons and there were two younger ones after him named Ancel and Henry. It was only through King Stephen’s kindness and the charming personality of young William that the child survived the experience. John died sometime between 1164 and 1165. His eldest son from his first marriage, named Gilbert after his grandfather died soon afterwards both of them having outlived John’s second son Walter. Thus it was the eldest son of the second marriage named John after his father who inherited John’s lands and job as marshal. When he died without legitimate male heirs the title and the lands passed to William Marshall who was by that time earl of Pembroke.